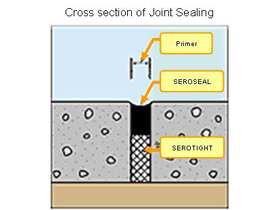 SEROSEAL is an asphalt-based hot applied joint sealant for concrete joints. 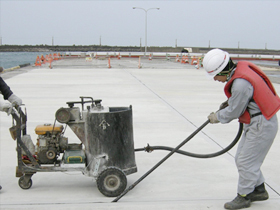 It conforms to the “Hot-applied Injected Joint Material Quality (Low elasticity type)” of the Pavement Design and Construction Guidelines. Even in the summer season when temperatures are high, it has outstanding extrusion resistance. Even in the winter season when temperatures are low, it will not become brittle, and will maintain elasticity. Has outstanding adhesive ability, so that it will stick firmly to the joint walls. Always maintains elasticity so that it will conform to the expansion and contraction of the concrete slabs and exhibit a high resistance to stripping.